Investors who want a pure play in the electric vehicle (EV) space might do well to consider investing in a few shares of Tesla Motors. Given the enthusiasm for the company's cars and its rapid growth rate, you might be able to afford one yourself in a few years just by selling the shares you purchase now. When I wrote that, Tesla shares were selling for $37.89. Did you buy them? If you did, good for you. I’d love to hear from you. Today, Tesla shares are trading for roughly $370. That’s a handsome 876% gain. Billionaire investor Ron Baron bought 1.6 million shares at prices between $208 and $210. Baron already has more than $264 million paper profit. But he’s not selling. In a CNBC interview on Tuesday, he said that he thinks Tesla’s shares will hit $1,000. You can see the video here. A $10,000 investment in Tesla when I recommended it would be worth $87,600. That’s more than enough to put you in the driver’s seat of a Tesla Model S sedan or a Model X SUV. I ought to know. I own a 2016 Model X P90D. It’s the most amazing automobile I’ve ever seen. And, God forbid, if my wife ever gets in an accident with it, she will likely come out fine. That’s because, this past Tuesday, the National Highway Traffic Safety Administration (NHTSA) gave Tesla’s Model X a five-star rating in every category it measures. That's the first time an SUV has ever received that rating. What's more, the Model X has the lowest probability of injury for any SUV the NHTSA has ever tested. The only vehicle rated safer than the Model X was Tesla’s Model S sedan. Shares continue to move higher, and the company has now topped BMW’s (OTC: BAMXF) market cap. It surpassed Ford (NYSE: F) and General Motors (NYSE: GM) a few weeks ago. At the annual meeting, Musk reaffirmed the July 2017 launch of the Model 3, Tesla’s low-priced sedan. The company expects to produce 500,000 vehicles in 2018. A large portion of those will be Model 3s. Musk has his work cut out for him. The company produced 84,000 EVs in 2016. And Tesla is going to be able to sell every car it produces. Why? Because all of the other traditional automobile manufacturers aren’t taking the switch to EVs seriously. In fact, they’re much further behind than the public thinks. These companies have no ability to produce EVs at levels of high volume like Tesla does. In fact, they won’t be able to do that until the mid-2020s at the earliest. That gives Tesla a monopolistic position in the EV industry for the foreseeable future. That’s just one pathway for Tesla shares to continue to head northward. The company is also selling a remarkable new roofing shingle that could replace traditional roofs. While Tesla’s roof is more expensive, it includes a solar cell in every shingle. Customers who install Tesla’s roofs and own EVs will be running their cars off sun power. What’s more, Tesla’s Powerwall energy storage units store electricity for use later in the day when the sun isn’t shining. What’s next for Tesla? Musk hinted at it at the annual meeting. In September, he’s unveiling the Tesla all-electric semitruck. Diesel fuel pollutes more (and costs more) than gasoline. Just imagine how much Tesla’s semi will disrupt the trucking industry. In the U.S., there are 15.5 million commercial trucks. And 2 million are tractor-trailers. The trucking industry uses 12.8% of all fuel purchased in the U.S. This compares to 63% for automobiles. Together, cars and trucks account for more than 75% of U.S. fuel purchases. Imagine removing even a portion of those purchases. In the long run, that would make a big dent in greenhouse gases and our fossil fuel energy needs. And in the short run, it’s going to make Tesla shareholders very well off. Few people know more about the electric vehicle market than Dave. His engineering background gives him a valuable understanding of how electric vehicles actually work. As Advanced Energy Strategist subscribers know, Dave also understands how to profitably invest in electric vehicle companies. He’s a big fan of Tesla... but he knows that there are other EV investing opportunities out there. One of them is Delphi Automotive PLC (NYSE: DLPH). It’s among the most lucrative fixtures of the Advanced Energy Strategist portfolio. Longtime readers know I’ve been fascinated by electric vehicles for nearly a decade. My wife and I have owned two of them over the last four years. One of the coolest features of our Tesla Model X is the ability for Tesla to download software updates to the car while it’s sitting in our garage. The updates fix bugs or add enhancements. Tesla sends a text letting us know an update is required and asking if it would be OK to do the update on a particular date at 3 a.m.
We always agree because, like most people, my wife and I are sleeping then. This is a big advantage for Tesla, which pioneered this technique. It turns out that other automakers may soon have similar capabilities, courtesy of Delphi Automotive PLC, one of our portfolio holdings. 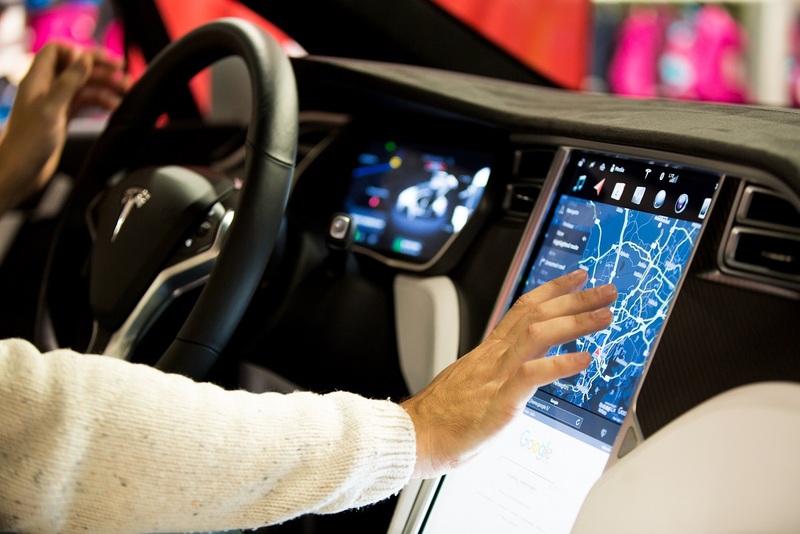 Delphi is putting together a software system that will allow other automakers to duplicate what Tesla has been doing. It’s been marketing its aftermarket system to automakers, claiming it will allow them to access and update vehicles as old as the 2010 models. The system will allow changes to engine control, the braking system and infotainment system computers over the airwaves. It is negotiating with a number of automakers to have its system built into new car models by 2020. In order to catch up with Tesla, Delphi has been snapping up companies that provide bits and pieces of the overall system. This past January, Delphi purchased a Plymouth, Michigan, startup company called Movimento for an undisclosed sum. Movimento has an over-the-air update system. Delphi also purchased a company called Control-Tec back in 2015 for its data analysis technology. The bottom line is Delphi’s new over-the-air update system could become a huge chunk of future revenue as some major automakers begin to integrate this capability into their new models.